In March 2018, the General Pharmaceutical Council (GPhC) introduced revalidation for all pharmacists and pharmacy technicians. The design of this new process will help to keep professional skills and knowledge up to date, create improvement pathways and demonstrate the difference you make to your community. It is also there to affirm the public’s trust in their pharmacy professionals. All practising pharmacists and pharmacy technicians will need to revalidate in order to remain on the register. When will I have to revalidate? Revalidation is now part of your renewal process. Therefore, your revalidation date will be the same as your registration deadline. You can review your revalidation timeline on the GPhC’s website. Pharmacy professionals with registration renewal deadlines of 31st October 2018 will be the first group to revalidate. 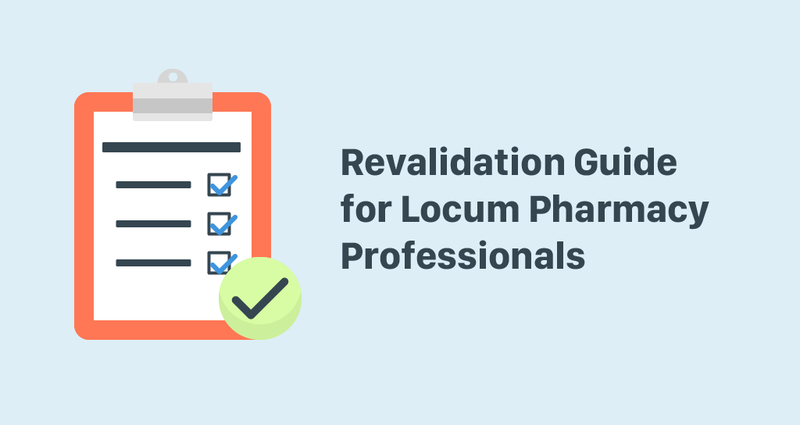 What is the revalidation process? As revalidation represents a change in process, you will only need to submit four CPD records instead of nine. Two of your CPD entries must be Planned Learning i.e. a proactive decision to improve certain skills or knowledge. Any form of real-time communication, such as face-to-face, video call or over the phone, can facilitate your peer discussion. Peer discussion is particularly important for locum professionals who are more likely to suffer from professional isolation. The GPhC will define a shortlist of pharmacy standards for each renewal year. You may find your peer discussion is a good way to identify what to include in your reflective account. Once you have completed you revalidation forms, you submit them via the updated myGPhC online system. For your first revalidation, you will only need to submit four CPD records. From the second revalidation year onwards, you will need to submit four CPD records plus the peer discussion form and reflective account form. Once submitted your records, my GPhC system will check there are the correct number or types of forms. Your records may be selected, either at random or as part of a targeted strategy and reviewed. If yours is reviewed, you will receive tailored feedback which can then be used as part of your learning for next year’s submission. You should have received a letter and an email from GPhC about the new process and invite you to register on the myGPhC online. Resources are available via the website www.pharmacyregulation.org including locum-specific forms and examples. But you can also email the GPhC on revalidation@pharmacyregulation.org if you have any questions or concerns.